We’d love your help. Let us know what’s wrong with this preview of Catholic Youth Bible-Nab by Anonymous. To ask other readers questions about Catholic Youth Bible-Nab, please sign up. Best book ever written. Read from cover to cover. It's a must read for everyone of all ages. Never believed I would actually finish!!! I'm glad I had written out a schedule, otherwise I would never had gotten this far! Were there days when I read nothing? Of course! Were there days that I read that I was a maniac and played catch-up? Of course! Am I glad I took the time to finally read it? Absolutely! this is such an amazing bible!!! it gives you everything you need to know on the margins and fun facts too. way better understanding of the word of God. helps me teach my kids in the class i teach so much better!!! I like this bible because it includes little facts about the authors of each of the books in the bible, the approximate date when it was written, and blurbs about connections to modern times. Let's be honest, I'm never going to finish this at the rate I'm going. I like this translation and the font is slightly larger than normal. OH YEAH. CAN YOU FEEL THE JESUS IN YOU? When I began, I doubted God and His merciless acts towards Moses in the desert. But after a challenge from my sister, I really learned. I sought to prove myself wrong and it's been eye-opening, to say the least. The Catho OH YEAH. CAN YOU FEEL THE JESUS IN YOU? 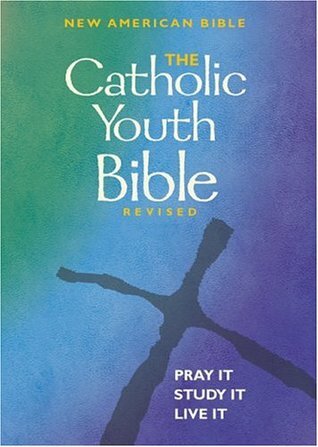 The Catholic Youth Bible, specifically, has a lot of relate-able quotations and cultural connections to make the text a lot more relevant to an adolescent's day-to-day struggles. They can be helpful but, for the most part, more distracting. Even though I'm no longer a youth, I still find myself enjoying this Bible tremendously. The translation is very reader-friendly and the footnotes are in-depth and helpful while not being overwhelming. I like the cultural emphasis, as well as the segments with questions to ponder. Top-notch Bible for a person (like me!) who has a challenging time getting through religious texts. Reading the New Testament all summer. Am not going to update page #s.
Kind of like the "Extreme Teen Bible", except for young adults.